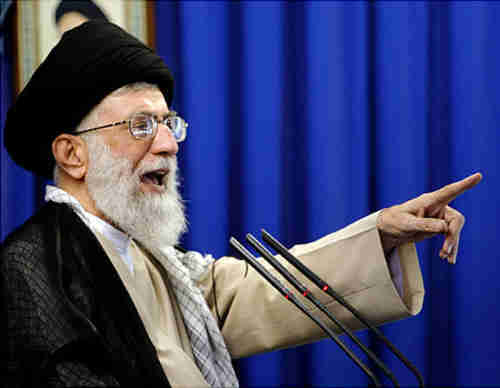 Iran's Assassination Plot Goal: Armed Clash With U.S. I often quote Debka reports because they have unique content based on intelligence sources not available elsewhere, and because they’re right more often than they’re wrong. According to Debka, the motivation for Iran’s plot to murder the Saudi ambassador to Washingon is a bid by the Iran’s Supreme Leader Ayatollah Ali Khamenei to draw the United States into a limited military clash. This would accomplish several objectives: To head off unrest within Iran; to deflect attention from Iran’s nuclear program; and to win international acclaim by being victimized by the U.S.
Iran’s last crisis war was the 1979 Great Islamic Revolution, followed by the Iran/Iraq war that ended in 1988. Like any crisis war, it unified the country behind its leaders. Today, Iran is in a generational Awakening era, and has experienced great disunity, including massive student protests, along with political opposition that’s expected to last for years. Iran’s geriatric leaders are desperately searching for a strategy that will unify the country again behind its leaders, just as occurred in the after the 1979 revolution. The strategy they’re using is the strategy that worked in 1979 — blame everything on the Great Satan (the United States), and even provoke a military action that will force the population to support its leaders, just as Iraq’s 1980 invasion of Iran did. The hardline Supreme Leader is attempting relive the glory days of his youth with a partial replay of the 1979 Islamic Revolution. At that time, the leader, Ayatollah Ruhollah Khomeini, was successful in unifying the entire country behind the Great Islamic Revolution by blaming everything on imperialism by the US and the West. Today’s desperate hope is to provoke a military action by Israel or the U.S. that would unify the country again. If Iran’s leaders understood generational theory, they would know why this strategy, which worked so well in 1979, cannot possibly work today, even if they did provoke an attack. In 1979, Iran was in a generational Crisis era, and the people were eager for a confrontation. Today, Iran is in a generational Awakening era, and the people have no desire for military action. The Debka report also explains why a Mexican drug cartel was to be used for the assassination, even though doing so seemed almost incompetent. For at least 20 years, Iran’s Lebanese proxy Hizbollah has kept itself in funds by drug trafficking, gunrunning and fencing stolen goods and today controls entire networks in Latin America and Africa. As it turns out, the assassination attempt has ended in an embarrassing failure for Iran, making them look incompetent and weak. This is certain to have repercussions with Iran’s government, and will energize the opposition movement that sparked large demonstrations following the allegedly fraudulent 2009 reelection of President Mahmoud Ahmadinejad.